To paint over drywall the first step is to look for flaws. 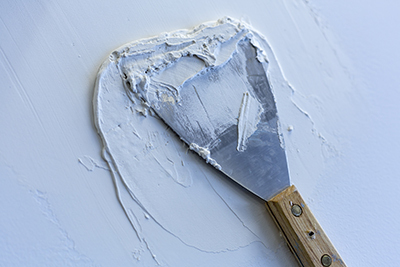 For a fresh coat of paint to give an appealing and top quality look, repair and smoothening of the walls should be done. Cracks, nail pops and shoddy taping can show up months after or even years later. Further, there are other defects like dents caused by furniture, holes formed due to doorknobs, shelving or picture hangers. When these defects are corrected and the painting done, the surface will look superior and attractive. 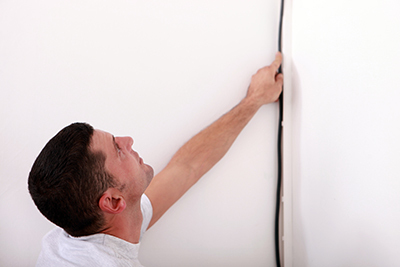 To find the minor faults shining a light on the wall surface will help in identifying the flaws. For nail pops, you need to drive a screw near the popped area and drive the nail below the surface of drywall. This leaves a concave shaped dent. Similarly small nail holes can be tapped on to form a small crater that can be filled using wall filler. For hairline cracks present on the inside corners, which are caused due to slight movement of adjoining walls, latex caulk should be used. The crack should be covered with a thin caulk line. Wet caulk should be molded into the crack after moistening it. The caulk is flexible and prevents the crack from appearing again. Too thick caulk layers should be avoided, as they may appear too rounded in case of a square shaped corner. For large holes, a portion of the drywall surrounding the hole should be removed and new drywall patch is added and joint taping done. For holes below 6 inches in diameter, a drywall patch of self-adhesive type is used. A mud layer is applied on the patch and the wall around it. Once the initial coat dries, a second joint compound layer fills the imperfections and then sanding is done. If you suspect lead in paint, paint removal should not be attempted, instead a qualified expert from should be contacted for proper assessment. At Drywall Repair Valencia we have just the people for the job. For mildew, bleach and water mixture should be used. For any glossy looking areas, fine grit should be used to sand them. All dirt should be removed by using mild detergent and water. Primer application gives better paint adhesion and blocks the stains in addition to providing an even sheen. Stain blocking or PVA latex primer should be used. For paint layer that is dirt resistant, cleanable and durable, a top quality latex paint should be given in an eggshell finish or flat finish based on the appearance. For better stain resistance and dirt resistance, a satin finish is required. For hiding irregularities on the surface, flat latex paint is the right choice but it will not be stain resistant and also does not give a satin or eggshell finish. For hiding most of the defects, the best way is to achieve a low luster finish rather than a shiny or glossy looking paint. Satin or flat paint helps in this aspect immensely. While glossy paint looks tacky, and causes a glare effect under lighting, a low luster finish that is washable is the best choice for painting over drywall.